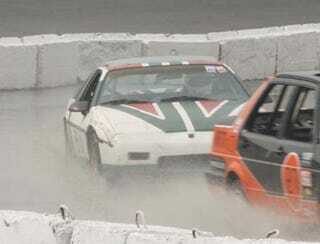 By all accounts, the Fiero was quite fast (vindicating the legions of Fiero zealots who fill their forums with lists of reasons for the Fiero being the ultimate 24 Hours of LeMons car), but then disaster struck. They got rear-ended in most crushing fashion by a team that will remain nameless (because I couldn't get that info) and the brake lines took some sort of impossible-to-repair-quickly damage. Let's hope they come to Houston next month for another try!